ALBUQUERQUE, N.M. — Shared fates and experiences in a community can help it withstand changes to water availability due to climate change, a recent study by Sandia National Laboratories researchers found. "During our research, a community's ability to withstand natural and social pressures was routinely pinpointed to the fact that the people who live there feel like they are a community," Thushara Gunda, a Sandia environmental engineer and the paper's first author said. "The social fabric of the community, the mutualism, or sense of cohesion, is a really important factor that contributes to its resilience." With changes in rainfall amounts, rising temperatures and population growth putting pressure on water resources around the globe, Sandia's study adds to the understanding and predictability of how communities and water systems worldwide will fare during times of environmental or social change. The work, part of Sandia's energy-water nexus program to help safeguard resilient and sustainable energy-water systems in the interest of national and global security, was recently published in a special socio-hydrology issue of Water Resources Research. The research paired a dynamic systems model of an acequia community and its water system with a hydrology model of an upland water source to study how the community responds to changes in water availability and flow. The study builds from a larger six-year collaborative project funded by the National Science Foundation that studies the relationships between traditional water management systems, communities and landscapes. In addition to Sandia, project research partners include New Mexico State University, the University of New Mexico and others. The researchers used a model based on the northern New Mexico town of Valdez, which is the farthest upriver of 11 acequia systems along the Rio Hondo. An acequia is a ditch that diverts water for farming and agricultural use from upland streams by using gravity and head gates. Acequia also refers to the community that uses and governs the ditch. There are about 800 acequias in northern New Mexico and southern Colorado. Some were originally built by Spanish colonists more than three centuries ago. "These acequias have gone through multiple changes in government, from colonial times to modern day, and survived throughout all those social changes," Gunda said. "Now they are facing natural changes from climate change and increasing demands from downstream users." Benjamin Turner, a professor at Texas A&M University – Kingsville and co-author of the paper, built the community model based on research conducted by an interdisciplinary team of cultural anthropologists, economists, political scientists, geographers, sociologists and hydrologists who worked to capture the dynamics of community acequia systems through months of workshops, phone calls and meetings. Once the model was completed, it was customized to represent Valdez. The Sandia team then developed a hydrological model of an upland water source to pair with the community model to study how decreases in water availability affected the community. The upland model incorporates temperature and precipitation projections that decrease the amount of water available and changes the arrival of peak water flow for the year. "We wanted to see how the community would respond when the streamflow changed based on how we think it will likely be affected by climate change in the future," Gunda said. "With climate change, especially in the Southwest, we are expecting to see a reduction in the total stream flow, but also a shift in when the peak stream flow occurs." The research team used the two models to simulate three different conditions. The three scenarios compare 30-year historical stream outputs from 1969 to 1998 to 30-year periods in the near future (2019 to 2048) and the far future (2069 to 2098). In the first scenario, the acequia experiences decreased water levels and an earlier peak flow — the month when the acequia receives the greatest amount of water. The community diverts water the same amount of time as before, and closes its gate to let water continue downstream about 25 percent of the time. 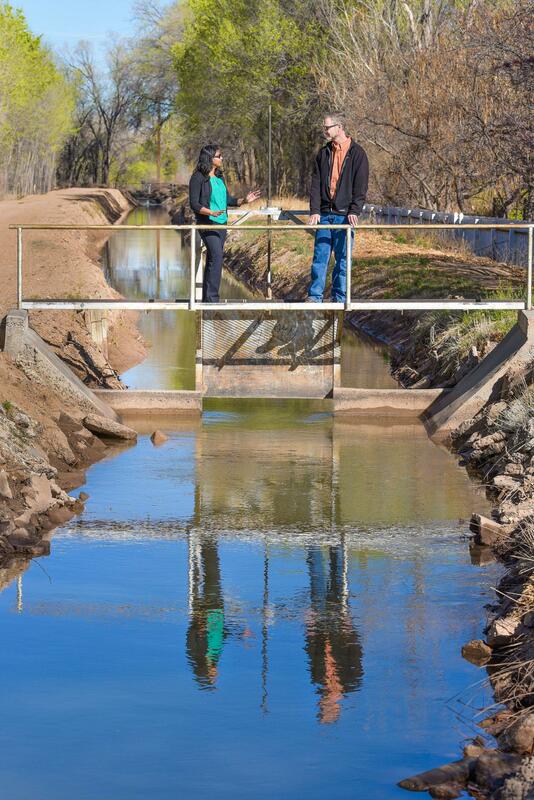 An acequia will close its gate to ensure downstream communities have sufficient access to the water based on standing agreements. In the second and third scenarios, the acequia still experiences decreased water levels and earlier peak flows, but also faces increased gate closures throughout the year, amounting to 50 percent of the year in the second scenario, and 75 percent of the year in the third scenario. This is based on the likely increased pressure from downstream users asking their upstream neighbors to divert less water. "The results of the study were surprising, in the sense that agricultural profitability actually increased during the first scenario," Gunda said. "With the shift in peak stream flows to earlier in the season due to climate change, the acequia members were able to use that earlier water more productively, and it created this feedback cycle where because they had more access to that water, they were able to grow more crops, including more profitable crops, and that incentivized them to invest in agriculture, and that time spent in agriculture strengthened the community." In the second and third scenarios, Gunda says agricultural profitability tanked, but the size of the community grew, because landowners were more likely to sell pieces of their parcels so new members could enter the community. "We can look at the history of acequias and see that they are not very sensitive to shock, otherwise they wouldn't have the capacity to stay together for as long as they have," Gunda said. "When newcomers enter the community and engage in agricultural work and help maintain the acequia, that reinforces the bonds of the community. It gives them the buffer to be able to stay together long enough to adapt to the new conditions." The findings show the mechanisms that strengthen community cohesion in acequias — time spent doing agricultural work and maintaining the ditch together — helped reinforce individual connections with the community, which softened the impacts of climate change and helped the acequia stay together. "By taking this sociological look at the system, it helped us see some behaviors and how these social systems might mitigate factors that would otherwise pose challenges that could cause these systems to disappear," said Vince Tidwell, Sandia engineer and co-author of the paper. While the study focused on acequias because of their historical resilience, Gunda said the findings have broader implications for communally-managed water systems worldwide. "In Sri Lanka, community cohesion is focused on kinship and passing down parcels of the land to your children, which perpetuates the connection of families to the land," Gunda said. "In Bali, the cohesion is focused around water temples and religious figures. All these different modes of community cohesion exist, and our modeling work shows that we really need to understand how these mechanisms for community cohesion can lend themselves to increased resilience in times of pressure. We need to understand the social structure as well as the physical environment."